The TO&A Court Reporting business center in 315 Montgomery is located in the heart of San Francisco`s financial district, with easy access to retail and residential centers, as well as public transportation. The building was completed in the early 20th Century and has 16 floors. 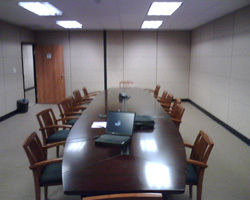 The business center is located on the 8th and 9th floor. Category-5 cabling is wired to each office to provide high-speed Internet access as well as reliable telecommunication services.